From a historical perspective, the Creeper Trail is a fascinating ride. The trail runs along a rail right-of-way that dates to the industrial expansion across the US in the 1880s and the accompanying iron ore speculation that ran even southward down to the western portion of Virginia. Many ask how they can get involved and support the trail and the efforts of the Creeper Trail Club. There are a multitude of ways that you can demonstrate your love and support for this treasured recreational trail – helping to ensure the preservation of the trail for future generations. If you’re visiting from out-of-town, a great place to start is right here! 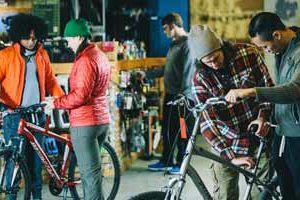 We’re proud to work with the bike shops, outfitters and shuttle operators in Damascus and Abingdon. They’re great folks for you to work with – friendly, knowledgeable and very helpful! 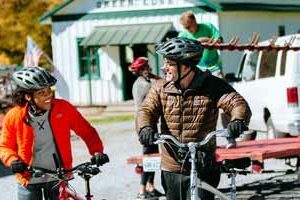 Want the Latest on the Creeper Trail? 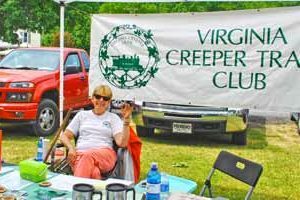 Our Mission: The Virginia Creeper Trail Club (VCTC) is a 501(c)(3) nonprofit volunteer organization dedicated to the maintenance and preservation of the Creeper Trail corridor. The VCTC partners with other trail stakeholders to support a safe and enjoyable experience for all trail users. We are the Virginia Creeper Trail Club. 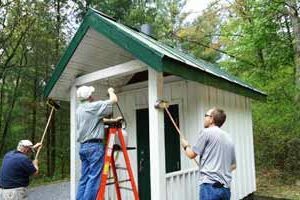 Two years after the trail officially opened in 1987, the Virginia Creeper Trail Club was formed as a volunteer organization to help maintain the trail and to supplement the efforts of the local towns and small communities’ staffs and budgets. In May 1997, the Club was granted nonprofit status and formally organized as a 501(c)(3). The Club governance is controlled by the Board of Directors. The elected leadership positions include President, Vice-President, Treasurer, Secretary and immediate Past President, along with eight Directors appointed by the President. Monthly meetings are held March through October for the general membership and are always open to the public. Archived meeting minutes can be found here. The current issue of the Creeper Trail Club’s newsletter can be found here. 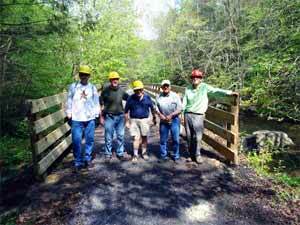 Over the last 28 years, our mission has evolved to include more complex maintenance and repair projects, often times working directly with our trail partners from the towns of Damascus and Abingdon and the US Forest Service (USFS) – and in most cases, we provide the necessary materials to complete these projects. We have also worked with families and friends to erect memorial benches along the trail. Annually, we organize a Trail Clean Up Day that is well-supported by Club members. Members clean the interpretive signage along the trail each year as well. Educating the general public about the history of the Creeper Trail and its unique geophysical and biological features through our speakers, on hikes and walks, at the Welcome Center and at our monthly meetings is an effort we believe helps to ensure the preservation of the trail for many generations to come. We also take an active role in enhancing the safety of the trail, most recently coordinating with Johnston Memorial Hospital to procure the donation of two defibrillators for locations on the trail. The Virginia Creeper Trail Club also holds a voting seat on the Trail Advisory Board. 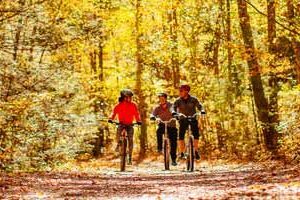 The Trail Advisory Board (TAB) includes stakeholders from the towns of Damascus and Abingdon, Washington County, adjacent private property owners, the USFS and the Virginia Creeper Trail Club. TAB oversees significant trail decisions, works to resolve disputes and address concerns, reacts and responds to proposals, and works to keep the best interest of the trail in the forefront. We welcome your suggestions and love to hear of your experiences and share your photos…and, as always, we’re here to answer your questions, too. Connect with us on Facebook and follow the VCTC on Twitter. All of our efforts are financially supported by you, the trail user, through your volunteerism, your memberships, merchandise purchases and donations, and we thank you. 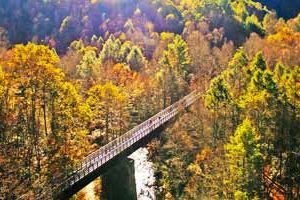 © 2019 Virginia Creeper Trail Club. All rights reserved.